How is upper eyelid surgery different in Asians? 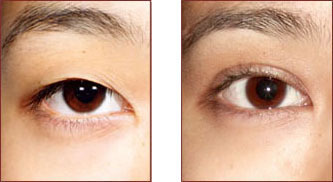 Asian patients often have an indistinct upper eyelid fold – the so-called “single eyelid”. This is because the skin in the eyelid is not as tightly stuck to the muscles that open the eyes, so the skin doesn’t get pulled into the crease on eye opening. Instead, the skin just bunches up above the lashes as the eye is opened. This makes application of makeup a challenge, and can give an appearance to the eye of being “heavy” or having too much skin even when it doesn’t. Unlike upper eyelid surgery in aging eyes, where the primary goal is to remove the excess skin, in the OB the purpose is to create a fold so that the skin lays down smoothly between the eyelashes and the crease when the eye is opened. There are several ways of accomplishing this goal, but all of them involve attaching the skin to the muscles that lift the eyelid so that the skin is pulled up when the eye is opened. How big should the crease be? This is a matter of personal preference. In the past, there was a mistaken belief that patients wanted to look more “Western” and the tendency was to make the crease too high. 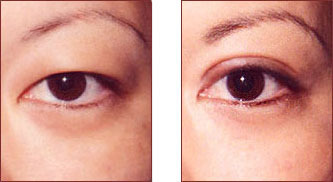 More modern techniques from Japan, Korea and Chine allow us to place the crease height according to the patients desires, with anything from a very subtle crease barely above the lashes and ranging all the way up to the very wide creases that were typically created in the past. Can it be done with just stitches and no cutting? Yes, depending on the patient. This technique works well in patients where the skin and fat are not too heavy (the sutures are not very strong). Because it is not held up very tightly, the crease has a tendency to fall back down over time, requiring re-operation. Even when a cut is needed, it usually heals with a very fine line which is hidden in the crease when the eyes are open. Does it require being put to sleep? No, the surgery is usually done with the patient awake and using just local anesthesia. This has the additional benefit of allowing the patient to open and close their eyes to allow precise adjustment of the fold during the surgery. No, we require that you have a responsible adult drive you home after the procedure. Your eyes may be bruised and swollen and may hinder your ability to safely operate a vehicle. You may also be interested in the following procedures facelift, neck liposuction or fat grafting.